New! Children's Stories of Animals Who Encountered Saints . . . Told from the Animals' Points of View! Three delightful stories for young children by Catholic author Susan Peek. Beautifully illustrated with black and white drawings. 8.5 x 11 inches. Soft Cover. 120 pages includes bonus Reproducible Coloring Book in the back! 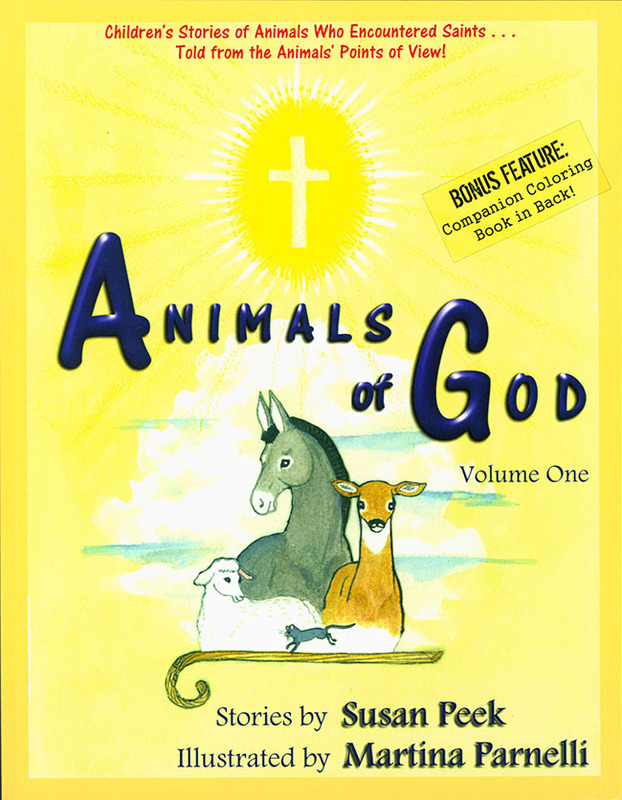 See also Animals of God: Two Volume Set. The Little Lamb's Wish Little Lamb lets out a big yawn. While other sheep are content munching on grass all day, Little Lamb is growing impatient with his day-in, day-out hum-drum existence. He longs for adventure, for something special to happen. When his mother suggests that he wish very hard, Little Lamb sets about wishing with all his might. Then one day, crowds of travelers appear on the road, heading to nearby Bethlehem. When Little Lamb spots a weary man with a beautiful Lady on a donkey, he feels certain his wish for something special is about to come true. . . The Hungry Gray Mule Meet Joshua, a little gray mule, and his kindhearted but stubborn Jewish owner, Guillard. After a chance encounter with Saint Anthony, the unbelieving Guillard throws out a challenge, demanding the saint to prove the true Presence of Our Lord in the Blessed Sacrament. When Saint Anthony accepts, unsuspecting little Joshua is locked away for three agonizing days and left to starve, yet he becomes the instrument God uses to show the entire town, without a shadow of a doubt, that the Holy Eucharist is indeed the Body of Christ. The Loyal Friend On a stormy night, a tiny fawn – lost and alone and frightened – meets a holy hermit living in a cave. Thus begins the heartwarming friendship between Saint Giles and a baby deer. But their idyllic life in the forest is soon to be shattered by the arrival of the king's hunters. With the deer in danger and fleeing for her life, Saint Giles is called upon to help his little friend.